The current political climate has turned a lot of things on their heads, and the world of American fiction is one of them. Books that seemed to mean a lot prior to November of last year now seem to mean very little, while overlooked books are suddenly achingly relevant. Even when writers are able to identify the major fissures in America’s cultural landscape, the conclusions that they offer can feel facile, trite, or overly optimistic. Books that don’t fit easily into one camp or another may find that they have no audience at all. During our interview, Matthew Neill Null said that he doesn’t consider himself an explainer, and maybe he isn’t. Maybe an explainer isn’t even what American literature needs right now. 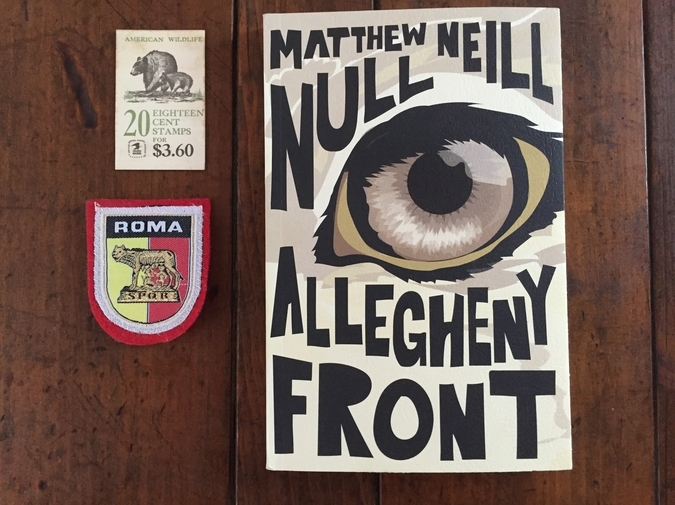 In the nine stories that constitute Allegheny Front, however, Null takes the reader into the depths of West Virginia — a place that has become synonymous with the white working class anger that brought us to our current political moment — and he does not flinch when it comes to presenting it honestly, now and in earlier epochs. More than any other book that I read last year, his is the one that I find myself thinking about as America slides into an increasingly disturbing status quo. Allegheny Front was published by Sarabande Books in the spring of 2016. Null was kind enough to answer via email my questions about setting, stylistic prose, and the motivation to write. Allegheny Front fits pretty nicely into the genre of “redneck explanation” books that emerged this year — Hillbilly Elegy by J. D. Vance and Strangers In Their Own Land by Arlie Russell were the big ones — and seemed to presage Trump's victory. Were you surprised that he won? And has it made you feel differently about your people back in West Virginia? I’ve always had sympathy for people out in the rural, rusty parts of the country — I’m from Pennsylvania, the interior of which is as rural and rusty as they come — but I find myself to be very angry at those people right now. You wrote a great, humanizing essay for Lithub earlier this year about “the obscure, the forgotten, the dismissed” places like West Virginia. Those places just reminded the rest of us that they exist in a dramatic way. I was wondering where your head’s at. I’ve not read either of those books, so I can’t speak to them, and I don’t consider myself an explainer, which puts me out of step with the times. People are craving explanation. Have you noticed that the most-lauded writers right now are interlocutors? James Baldwin, Maggie Nelson, Claudia Rankine (I’m naming the best ones), and then all the pretenders. I’ve never considered myself part of the conversation. My people are the un-explainers — I’m thinking Malcolm Lowry or Isaac Babel, for example — where you come out of the reading experience more baffled and unsettled than you did at the beginning. Maybe it’s because writers like Baldwin/Nelson/Rankine have an aspirational and hopeful quality, despite all evidence to the contrary, that the world will wind slowly to a perceived moral ideal. But I can’t see it that way, I see an ocean of chaos with the thinnest veneer of civilization on top. The struggle of infinite people for finite resources. It’s the same reason I could never fully commit to Marxism, with its mystical endgame vision of History, where we move implacably to a single secular rapture. I’ve lived in a place where each new year is worse than the last. The harvest is passed, the summer is ended, and we are not saved. No, I am not surprised Trump won, I expected it, so my feelings about the place could not have changed. I’m only surprised that a figure like him didn’t ascend twenty years ago. One story in Allegheny Front, “In the Second District,” points in this direction. I’ve my feelings about why he won, but as someone with a foot in that white working-class world and the other in the hyper-educated elite, I’ve found that my opinions please no one. Let us just say that the rain of delusion has fallen hard upon our American land. It’s tempting to read Rose and Conner as the two Americas, Blue and Red. How a gulf of culture and education and opportunity has opened up between them, and how, when the Blue bothers to look at the Red, it does so with mix of paternalism and disdain. But it’s also tempting to see in their relationship the writer’s dilemma, and that’s what I’m more interested in: the way you as a writer must position yourself toward your subject matter. You’ve written two West Virginia books now (Allegheny Front and your 2015 novel Honey From The Lion). You’re clearly grappling with this place that you’re from (the way many writers do, though certainly not all of them). What do you see as your function, as a writer, in relation to that specific place? If you’re an American writer living/writing outside of the I-95 corridor, you’re going to be regarded as a provincialist. The condescension is palpable. Being from WV, you come to expect condescension, period. It’s funny, I’m living in Rome this year, and I was invited to a luncheon at the Académie française, which is this imposing stone temple of art that overlooks the city. It was very French, long lunch, heavy red wine, then they corralled the writers into one room and asked us to discuss a Calvino text. I like Calvino, but that’s hard-going on a full stomach. There were Germans, French, Spaniards, etc. — I was the lone American, and we were trying to get by on this salad of languages. To my shame I had the typical American problem of having less language than anyone else in the room. I’d had a nice time sitting by this French novelist at the luncheon, I thought we were pals, and he turns to me and unleashes this torrent of bitching, ending by saying, basically, “I’m sick of caring about America, nobody cares about a Romanian writer until he’s read in America, why are we obsessed with Jim Harrison’s Montana? Why don't we read novels set in the Ardèche? The Ardèche is our Montana.” And it was a funny moment, because Europeans think of Jim Harrison as this superstar, but he wasn't read or reviewed by major publications in America until he had been famous in France for twenty years and the slicks could no longer ignore him. So it’s an uphill climb. I’d love to read a novel about the Ardèche, a fascinating place. And I agreed with the French novelist that, each year, American corporate publishing produces a mountain of trash and just enough interesting books to prop a wheelbarrow. But he assumed I was the embodiment of it, an amusing episode — he didn’t know I’m obscure in my country and published by indies. But then, crossing borders has a way of warping things. Italian writers are baffled that Elena Ferrante is this international sensation. (3) There does seem to be a weird hierarchy of desirable American settings for fiction. I’ve run into a little resistance myself just in writing about Philadelphia as much as I do, which, though it falls along the 1-95 corridor, is deemed less intriguing than Boston or Brooklyn or D.C. for some reason. Has living away from West Virginia benefited your work, do you think? You said in your interview with Tobias Carroll in Electric Literature that you wrote these stories all over: Iowa, Wyoming, Florida, Massachusetts. Now you’re in Rome. Do you think that it’s necessary to get some physical distance from a subject, if the subject is a place? And how do you manage to still “tell it like it is” when it’s been a few years since you’ve lived in that place? The question’s interesting because it’s in flux for me. Despite having bounced around many places, I didn’t find that any of them had an appreciable impact on my writing, as it’s so clued to one place, regardless of whether or not I’m there. But being in Italy is shaping the work in ways I’m just beginning to realize, because it’s radically different. This is the first time I’ve lived in a place where another language is spoken. The dislocation is pleasantly jarring. I have to decipher the signs, just as I slowly read Ossi di seppia like a cabbalist, page of Italian on the left, page of English on the right. The most banal things — a woman grinding out her cigarette against a monument, an argument over a car accident — shine in an exaggerated light. The country is fascinating and complex, but like the United States in that you have these diverse regions held together by a tenuous web of federalism. In the Risorgimento, 1871, only 5% of the Italy's population spoke “standard” Italian, and speakers of dialects were nearly unintelligible to one another. Amazing the country ever cohered. I love it here. There’s a level of functional dysfunction that makes a West Virginian feel at home. The bus timetable is utter fantasy, you know? My favorite regions are the forgotten ones, Sardinia, Le Marche, Puglia. So I’m becoming more appreciative of distance, here. I can’t call distance “necessary,” but it changes the relationship to the subject matter. Brendan Behan nailed himself to a Dublin barstool. Joyce went to Trieste, Paris, and Zurich. Both mapped Dublin in interesting, but countervailing, ways. For every example there is a counter-example. In the last decade I’ve bounced back and forth to West Virginia, so I’ve never had trouble keeping an oar in the current. That’s where my family is & our land. If I were away for decades, I’m sure it would be harder…but then, Joyce relied on memory and letters from his brother Stanislaus. Childhood and youth gives you so much material. I’d rather stay in WV, but I’ve never been able to find money there — I’d be getting nine dollars an hour for pounding nails. Now I have a kid so the need’s sharper. I just took a visiting writer gig in New England for the coming year. That fatalism reminds me of my own people. Maybe that’s why I feel at home? Everything is bound to go wrong anyway, expect the worst, people are not saints, you’ll never be an astronaut, try to enjoy the day despite it. A Violent Life is a great one. I love Pasolini’s incidental writing as well, especially the sketch about the hunters of Rome who are up in arms because their hounds are no longer allowed onboard the city trams. Pasolini attends their annual meeting. It’s great. I’ve loved Italian fiction for its richness and range. Giuseppe Tomasi di Lampedusa’s The Leopard is a top-ten novel for me and has influenced my style as much as anything. I’m discovering new things. I’ve fallen for Ignazio Silone's Fontamara, a deft political novel, one of the hardest things to pull off. (And out of print in America.) Dino Buzzati's The Tartar Steppe is a classic and should be better known. Carlo Levi's Christ Stopped at Eboli is pitch-perfect. Leonardo Sciascia is my newest enthusiasm. But the poetry might be most interesting. Italy’s beloved national poets are strange cases. Eugenio Montale is this master of equivocation. Leopardi is the anti-Walt Whitman, his massive work is shaped by this complete and battering pessimism. “What was that acid spot in time/That went by the name of life?” But school-children still memorize his verses. He was a sickly, hunchbacked genius from Le Marche. There’s this green emptiness in Le Marche — pure Leopardi — and the Adriatic falling away. (5) One of the tensions that I came across over and over in Italian fiction was the one between North and South. The industrial and cultural centers of Northern Italy (Genoa, Milan, Florence) have historically viewed southern Italians as bumpkins and criminals, while the people in the South (Naples, Calabria, Sicily) regarded northern Italians as imperialists and oppressors. It all fits very neatly into post-colonial lit theory. It also brings to mind certain North/South parallels in our own country. West Virginia isn’t quite the South — it exists because it refused to join the Confederacy — but it seems to share in some of the South’s cultural features. I wonder if you see that North/South tension as an essential element of American literature, or in your own writing? Southerners think that West Virginia is the north, and northerners think West Virginia is the south. A high school classmate of mine ran his mom’s minivan into the Mason-Dixon monument on the county line and gained about seven feet for the south. Multiply that out & it’s a good spot of ground. But then the road crew came out & propped it back up, ending the geographical crisis. Now it’s encased in glass. If I had to carve out a new state, I’d link it with western Pennsylvania, eastern Ohio, and extreme western Maryland, for cultural and geological reasons, for their shared history and political dynamic. Wouldn’t it make more sense to group states by mountains and watersheds? The real tension in America is between the country and the city. It flares and subsides and flares again. The Whiskey Rebellion was the domestic crisis of Washington’s presidency and nearly killed the republic in its cradle. The city has always won out. That’s where the wealth is. In America, money always wins. It’s remarkable what money can do. In a castling move, the corporation sells you your own rebellion. Silicon Valley of late has set itself up as this great supporter of human rights, a counterweight to Trump, but it still crafts its overpriced bits of plastic in hellish factories overseas where the workers have no protections, work endless hours for bread, and commit suicide at alarming rates. America has quickly taken the Silicon Valley ethos of planned obsolescence to heart. Now we’re told that huge swaths of the country are obsolete, and the people should move somewhere where they can be more useful. Useful to whom? When I was in college, I wanted to write an expansive, open-ended history of this urban/rural tension — my model was Walter Benjamin's The Arcades Project — but then I realized it would take a lifetime and, ultimately, no one would read it but my mother. (6) You seem to take a deep historical perspective in your fiction. I was very impressed by how the collection features stories set in previous eras alongside stories set today, as though to suggest it’s all one continuous situation (which it is). How did you go about finding the narrative voices for stories like “Something You Can’t Live Without” or “The Slow Lean of Time,” which are set in the 19th century? The language seems to have a slightly old-fashioned patina to it, but it successfully avoids the stiltedness of pastiche or literary reenactment. Thanks for saying that. I wanted Allegheny Front to cover three hundred years of history, but it’s strange, I perceive a different relationship to time. I don’t even see it as a continuum. Just one moment, stretched like taffy. Someone was telling me the other day, “Historical fiction is a cop-out, it isn’t engaging with the real world,” and it was baffling, I just couldn’t understand. I found myself asking, “What world?” When I read, I notice style first, that’s what draws my attention, and a realization of time, place, and character comes after. I’ll read the phonebook if it has a style. But you are picking up on something there — in those two stories in particular, I tried to describe the look and the tactile elements of lost worlds in extreme detail, or invent extreme detail, since it’s a time and place that’s foreign to most and I wanted to take advantage of that bewilderment, guide the reader, make them touch, feel, and taste it. So I took my usual style and forced it a couple notches higher. My novel’s in a similar mode. I admired what Cormac McCarthy did in Blood Meridian, pushing it to a level of hallucinatory detail that you must either accept or reject like a transplanted organ, there’s no middle ground. Have you read Michael Herr’s Dispatches or Bruce Chatwin’s The Viceroy of Ouidah? The details are so rich, so strange, they’d kill a synesthete. In Chatwin’s book, a trader in the market is trying to sell the “excrement of a rainbow.” I loved having to imagine, in what is essentially a realist novel, the excrement of a rainbow. So whether I set a story in 1812 or 2012, I do have a certain house style — my sentences tend to be image-rich and a bit contorted — the majority of editors who have published my work have been poets, for which I remain grateful. If you’re a fiction writer, find your two or three poet friends and see if the work stands up to their scrutiny. My wisdom is limited, but really, find your poets. (7) It seems like publishing can be more difficult for stylists, exactly because stylistic writing forces the mainstream fiction crowd to work a little harder. I recently read Jaimy Gordon's Lord of Misrule, which is pretty unrelenting in terms of how textured the prose is, and how closely it hews to the idiolects of the various POV characters. And it’s great. It’s an amazing book. But it came out on a very small press, initially. But then it won the National Book Award. So I’m not really sure what the lesson is there. Have you ever thought about writing in a more workmanlike prose, for the sake of finding a wider audience? No. I couldn’t do that. My style is all I have, it’s my thumbprint. Straightforward prose would definitely make it easier to get my work published, but then, I just try to write books that I would like to read. Writers with a discernible style are what I read for. There’s no lack of vanilla fiction in the world, so why add to that teetering stack? The publishing world is much more conservative than it was thirty years ago, even twenty. It’s so market-driven, you have the marketing department actually weighing in before an editor takes a novel, it’s insane. So a stylist is at an immediate disadvantage. Publishing works best when you have one person making a decision, taking a chance. Once you start calling in more people, the results inevitably skew conservative. People forget that New Directions lost money every year, for decades, and could only survive because James Laughlin had all that Pittsburgh steel money. He cared about art, rather than creating entertainments or comforts. Jaimy is an incredible writer, utterly deserving of the attention, and it took thirty years for the world to catch up with her. You could take the lesson: ‘Keep the faith, plow your row, do good enough work & the world cannot ignore you forever.’ I don’t believe that, myself. I’m not sure there’s any rhyme or reason. (8) How have you stayed motivated? As you said, there doesn’t seem to be a lot of rhyme or reason to how books become popular or successful or find a readership. So much is out of the author’s hands. It seems like a writer needs to find the right way to look at everything in order to keep moving forward in the face of rejection and apathy. That’s tough. Just before John Cheever died, sick from cancer, he said in a speech that, ‘A page of good prose remains invincible.’ I believe that. Strong, risk-taking work has a lasting, intrinsic value that a bomb can’t shake. This is in the same nature as religious faith. You don’t struggle forward in spite of the world’s indifference and laughter, you struggle forward because of it. I’m still chasing that page. Every day I wake up feeling I’ve failed in all matters, but that page gives me a chance to redeem life by nightfall. Accolades are wonderful, everyone wants to be recognized, but careerism is the enemy. Books matter. Credentials do not. You know, Flaubert was never elected to the Académie française, for political reasons I suppose. He wrote, ‘Success is a result; it must not be a goal.’ (Cutting to the heart of the matter, he said of the Academy, ‘Always denigrate it, but try to be a member.’) G.B. Edwards never lived to see his great novel published. Lucia Berlin is just now receiving a deserved revival — and that’s a cautionary tale about corporate publishing, which let her struggle in poverty for decades and now skims money off her after death. Many of us will not ‘debut’ until middle age or later, and the cult of youth (‘5 Under 35,’ etc.) must be stopped. At the end of your life, no one will care if you won X award, were inducted into Y, became tenured as the Distinguished Professor of Z, had to wash floors to support yourself, disappointed your dad, wrecked your credit score, or were praised in the New York Times, that cultural bulldozer — hell, most books I cherish were panned by the Times and even more were ignored. People will care if you wrote good books. All else falls away. For the secular person, it’s your only bid for immortality. (9) What’s your next project? If my aim is true, I’ll finish a draft of a new novel by summer’s end. I hesitate to speak of it beyond saying it concerns political corruption and political disappointment, in the form of a couple individuals who are offered up to the bonfire. The novel spans the 1920s to 1997, from West Virginia to Spain to D.C. to Black Mountain College, but most of it takes place in the mid-1960s in Nicholas County, land of my birth. Maybe it will get published one day? Maybe not? It’s the most ambitious work I’ve done. 10) Can you just say some nice things about Provincetown, here at the end? You spent a couple of years there, as first a fiction fellow and then the Writing Coordinator at the Fine Arts Work Center. I was a fiction fellow this past winter and was recently kicked back out into the real world. It's a unique place. What do you miss about it? When Black Mountain College shut down, some of those people found their way to Provincetown and founded the FAWC. I like to think of it as the last bastion of that experimental-libertarian Black Mountain spirit. The FAWC is unique for a long-term residency in that it stands apart from the university system. The relationship between artists and the academy has gotten too cozy. It should only be a marriage of convenience. True, the FAWC could use the level of funding a university provides, as it exists on a shoestring and has nearly closed down many times, but the trade-off is a radical freedom. You take ten writers and ten artists and put them in this weird, isolated fishing village that has always been a haven for freaks & sailors. The tidal landscape is strange & stunning. I found that young artists & writers have gotten so used to the language and mores of the university that it takes a bit of effort to shake them out of that mode. When people showed up at the FAWC, I’d say, “I’m not your dean, I’m not here to fix your problems and your disagreements, there are no classes, I’m not handing you a program from on high, this community is what you make of it. This time is about you facing your work, alone, and that is excruciating but necessary.” Everyone gets a little crazy there come February, but the crisis is necessary and you pull through it with an understanding of how to live as an artist. The FAWC has my lasting loyalty. I do feel the place takes risks on writers who may be, on first and second glance, overlooked by the big busy world. Jaimy Gordon’s a good case in point. Denis Johnson. Tyehimba Jess. Abraham Smith. We read blind applications by writers who have not yet published books, and we had a necessary, ironbound recusal process. When I was there, I tried to advocate for ambitious work. You know how the book world is, awards beget awards, the laurels fall on a choice few, the logs roll, there’s little risk-taking. So I loved that the FAWC made risk-taking an ethos. Passion was valued over consensus.